Not all generations are created equal. Growing up during different times of communication and technological advancements, each generation of donors has cultivated distinct ways to connect with causes they’re passionate about. Younger, tech-savvy donors embrace mobile and social giving trends while seniors still give heavily through direct mail. At the same time, the rapid speed at which people adopt new technologies is driving nonprofits to build multichannel strategies to engage these different generations of donors in the ways they like to be engaged. Below, we breakdown each generation of supporter and provide different tactics to help you cater to their unique interests. 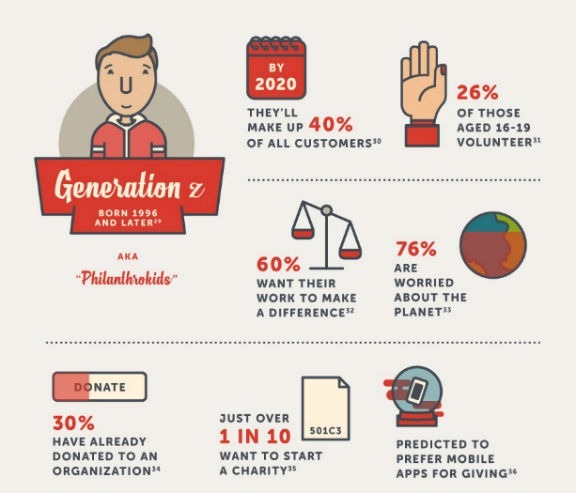 Read the full Generational Giving Infographic here. Generation Z (Gen Z) is the youngest of these groups, but as they grow up the social sector is rushing to understand their motivations for giving. They’re often referred to as “Philanthroteens,” meaning that they’re motivated to support nonprofits and drive social impact. Unlike millennials who grew up in a mostly positive and stable economic environment, Gen Z has been exposed to things like economic instability, polarizing social issues, and larger-than-life global challenges. As a result, and partly because of the hyper-awareness of this driven by technology and social media, Gen Z is hungry to make this world a better place. It’s up to you to engage them in ways that speak directly to their passion for change. Having grown up in a technological age, Gen Z will know inauthentic marketing from your nonprofit when they see it. That is, they know you have access to crucial data about them as individuals and, as such, expect your appeals to cater to their unique lifestyles and interests. It’s not enough to meet Gen Z on their turf, you need to be ready with hyper-targeted content that you can deliver directly to them. For example, about 60 percent of Gen Z wants their workplace to do social good in the world. Your nonprofit could prioritize locking down corporate partners that are popular with younger demographics, thus making your nonprofit’s brand synonymous with this company’s desire to do good. That, in turn, can drive young generations of employees to that company and to your nonprofit in the form of new donors. Gen Z is heavily active on social media, but according to Hootsuite, you’ve got to be smart about when, where, and how you leverage social media channels. One way you could get past this is to increase your paid advertising spend across social media platforms. Hootsuite tells us that “as digital natives, Gen Zers have developed a high tolerance for digital ads.” Further, 26 percent of Gen Z thinks there are too many ads on Facebook, and only 11 percent think there are too many ads on Instagram and Snapchat. Those numbers tell us there’s an opportunity to double down and push more ads on those platforms. Organizations of all sizes and missions need a strategy to engage Millennials. According to the Pew Research Center, the Millennial generation is set to become the country’s largest living generation in 2015, outpacing the entire Baby Boomer population. As this demographic continues to grow, nonprofits realize how critical it is to start drawing Millennials into their mission today. 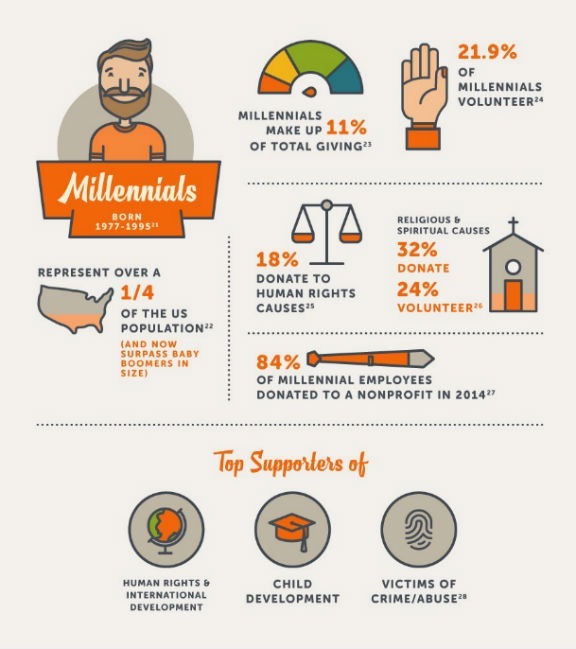 It’s no shocker that Millennials want to engage with nonprofits online. When beefing up your online giving experience to draw in Millennials, you need to make sure it’s mobile-friendly: 25 percent of donors use their phones to find nonprofits they were previously unaware of, and 25 percent also use their phones to complete donations. The best way to keep Millennials engaged is to use responsive design. This allows emails, websites, and donation pages to format properly across mobile devices. Millennials stay ultra connected to their peers, which is why peer-to-peer fundraising is highly popular with this generation of donors. Your peer-to-peer campaign has the potential to activate a vast majority of young fundraisers, who can then tap their own networks for support. In fact, 64 percent of respondents raise money for walk/run/cycling events, and 46 percent prefer asking people to replace physical birthday gifts with a donation to a specific nonprofit. This last statistic underscores the personalization options Millennials want from their fundraising and giving experience—options that are made possible through a year-round peer-to-peer fundraising program. By adding this permanent fundraising option to your website, you allow supporters to use their birthdays, anniversaries, athletic milestones, or other life events to fundraise for your cause. Generation X represents about 20 percent of the U.S. population, and almost 50 percent of them are enrolled in a monthly giving program. Compared to Millennials, more established Gen X donors are likelier to make a monetary gift to support a cause. They also give more frequently than other age groups. This generation values donating and connecting with nonprofits online, especially through mobile devices and social media. Around 59 percent of Generation X is inspired to donate to charity by a message or image they saw on social media. It’s up to your nonprofit to establish relationships with these donors, build trust, and give them opportunities to act on behalf of your cause. In order to win the support of younger generations, transparency needs to be one of your organization’s top values. Half of Gen X respondents, and 60 percent of Millennials, say that their decision to donate hinges greatly on whether they can see their gift’s impact. Make sure your website details exactly where donations will go. Translate dollar amounts into tangible results, and provide proof through visual content like photos and videos of your work being carried out on the ground. Providing this essential information up front can help you build trust and win over these discerning donors. Younger donors also tend to partake in workplace philanthropy. Both Gen X and Millennial donors are four to five times more likely to participate in corporately sponsored fundraisers like walks, runs, or cycling events. Tap into these pools of support by collaborating with corporate sponsors. 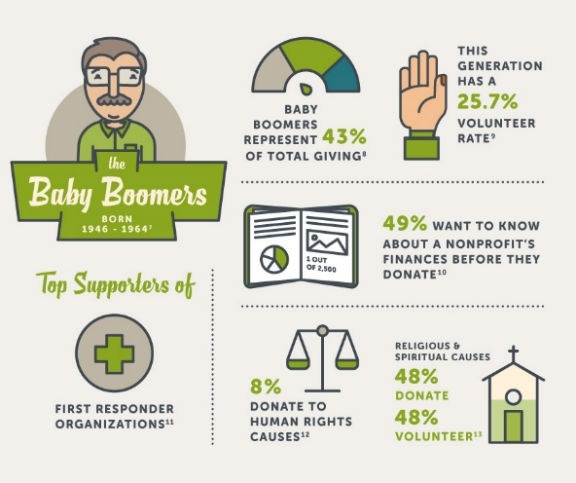 Baby Boomers represent the top source of income for nonprofits. They make up 34 percent of the nation’s annual donor base, but they contribute 43 percent of all gifts made by individuals. While they still engage with nonprofits through direct mail, their online giving and social media use continues to spike. Where Boomers used to give primarily through direct mail appeals, they tend to donate online more now: 49 percent are enrolled in monthly giving campaigns and 35 percent donate to crowdfunding campaigns, but only 24 percent gave in response to direct mail. In addition to ramping up your online fundraising, a great way to draw in Boomer donors is to promote your recurring giving program. This is especially relevant given that 49 percent of Boomers are currently enrolled in monthly giving programs. There’s a good chance your Boomer donors forged a connection with your nonprofit in earlier years, and they’ve been loyal supporters since. Reach out to the donors who’ve regularly supported you, and ask them to join your special group of monthly donors. Emphasize that automated monthly giving is an easy way to support the programs they care about. Millennials and Gen X donors aren’t the only ones who can fundraise. Other generations, like your Baby Boomers or Matures, can fundraise just as effectively as their younger counterparts. As with all supporters, they just need to be given the right tools, resources, and encouragement to get started. Reach out to these groups and provide the materials they need, whether it’s email templates, sample social media copy, or help in setting up their personal fundraising pages. By empowering these donors to fundraise over the Internet and social media, you can actually guide them to the channels where their younger family members and friends might be active. Your older donor base can thus attract the younger generations to your organization. This age bracket represents 26 percent of overall giving. Out of your entire donor pool, Mature donors rely the most on direct mail to support and engage with the causes they care about. What’s interesting is that about 35 percent of Matures have made an online gift in the last year, and on average give 25 percent more frequently than the younger generations. These donors are more than capable of becoming solid members of your online fundraising community. Direct mail may be a tried and true communication channel for these donors, but make sure to build a broader, multichannel strategy that includes these supporters. These older donors still go online, and increasing your touch points through an online presence can keep your organization top of mind. At the end of the day, a multichannel communication strategy helps ensure you reach and engage all generations of supporters. Amplifying your online strategy, in particular, is key to strengthening connections across age brackets. Spend the time and effort to optimize your digital communications and tactics, and you’ll be able to deepen relationships not just for support today, but for future giving among younger supporters. While each generation is different in how they like to be engaged, they’re all united by the fact that they support the social sector. If you’ve got any special tactics that work well with certain demographics, feel free to leave a comment below and let us know.